Is it the homespun ambiance of Balzar that makes true believers? 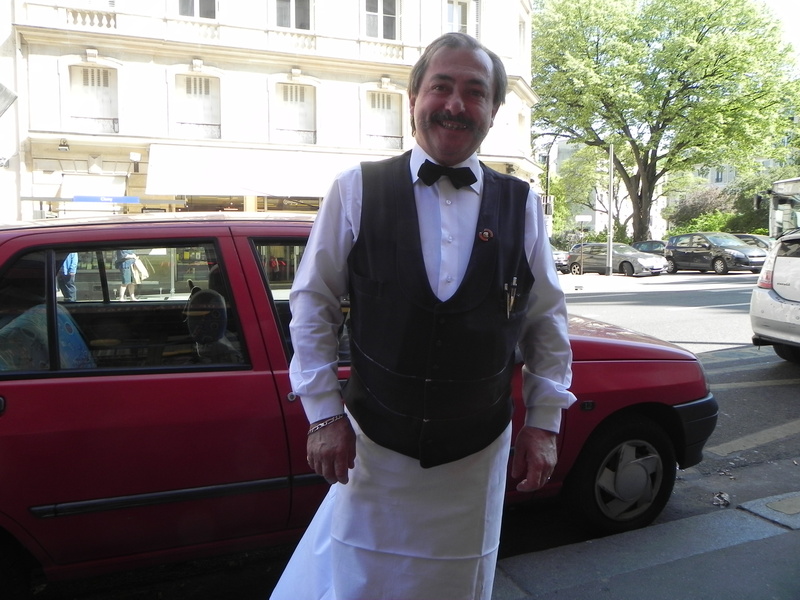 Online reviews cite Balzar as “the best brasserie in Paris offering hearty traditional cuisine” and “THE single meal a first-timer in Paris should experience”. So, dear Readership, what did I miss? Are Balzar believers entranced by the potted palms and mirrored walls behind the banquettes? Are they loyal to a favourite waiter who knows their preferences by heart? Or is it the homey decor that utilizes spare surfaces for storing cutlery, straws, cheeses, bread knives, petit-fours, salad bowls and spare linens. Melinda was the perfect unbiased dining companion with whom to unravel the mystery of Balzar. We ordered a light lunch and inaugurated our exploration with a chilled rosé and a basket of french bread which was, I must say, just superlative. Perhaps my star and Balzar’s were about to have a happy collision at last. 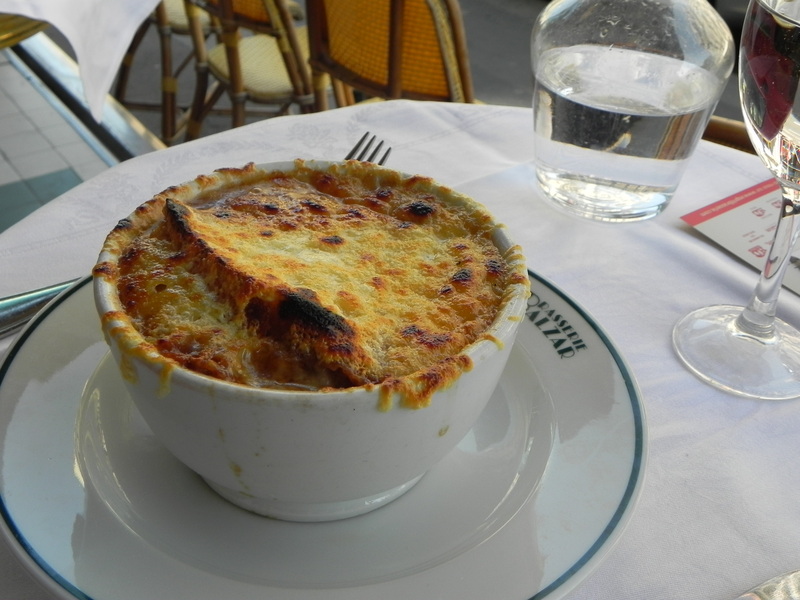 Is this onion soup the best in Paris? Melinda’s soupe gratinée à l‘oignon Balzar was the subject of an ET controlled comparison to see how it stood up to the onion soup from Au Pied de Cochon, which we devoured earlier in the trip. Well, dear Readership, Balzar’s soup was hearty and gooey with cheese, but it wasn’t as flavorful as its competitor across the Seine. And just to be perfectly clear – there was no bias based on our consumption of rosé . We were very careful to drink just as much at Balzar as we enjoyed at Au Pied de Cochon. The ETs are completely scientific in our methods. 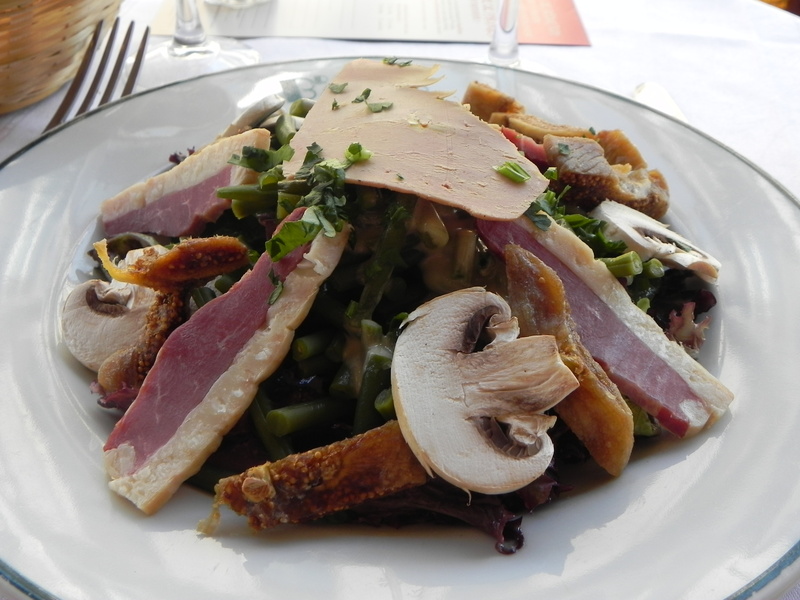 My salade gourmande au foie gras de canard et magret fumé, figues séchées was actually spectacular, with generous slices of smoked duck, plenty of foie gras, a light dressing and lovely dried figs. I began to warm toward Balzar over this salad and hoped it would elevate me to the brasserie’s holy anointed. Our meal was satisfactory – actually better than my 2009 excursion – but not truly memorable, or inexpensive by ET standards (about 40 euro for two of us). Again, I am left wondering what makes this brasserie so dear to so many. I clearly have a secret desire – nay, an obsession – to belong to the select group of Balzar fanatics. But it is not to be. 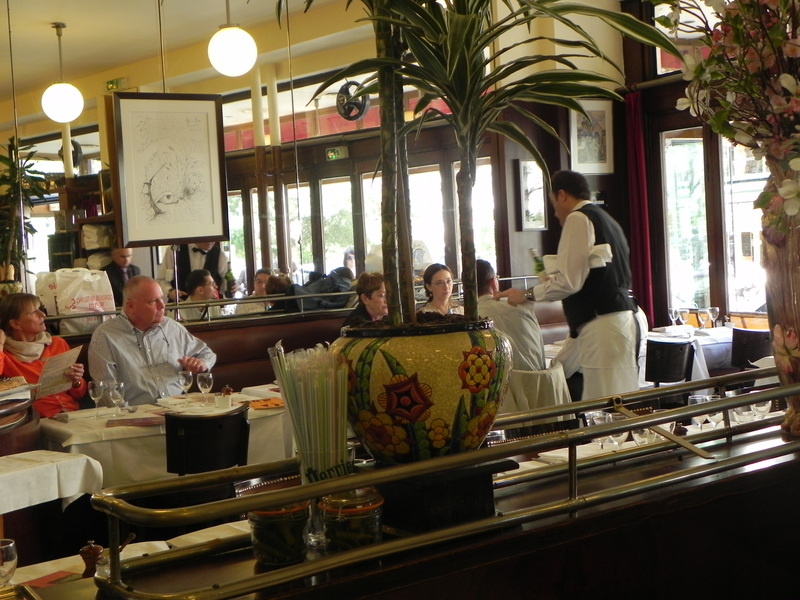 The ETs must find their own Alsatian hideaway – a Parisian brasserie that inspires loyalty and devotion. It could take years to accomplish, which is all the better for the Readership who so loves to read about food! This entry was posted on November 10, 2011 at 7:16 pm and is filed under Dining, French food. You can follow any responses to this entry through the RSS 2.0 feed. You can leave a response, or trackback from your own site. I suggest that I, as an unbiased third party, sample a sample of that soup and salad on our next trip. Well done, Nurse! You will be the final arbitrator in l’Affaire Balzar. 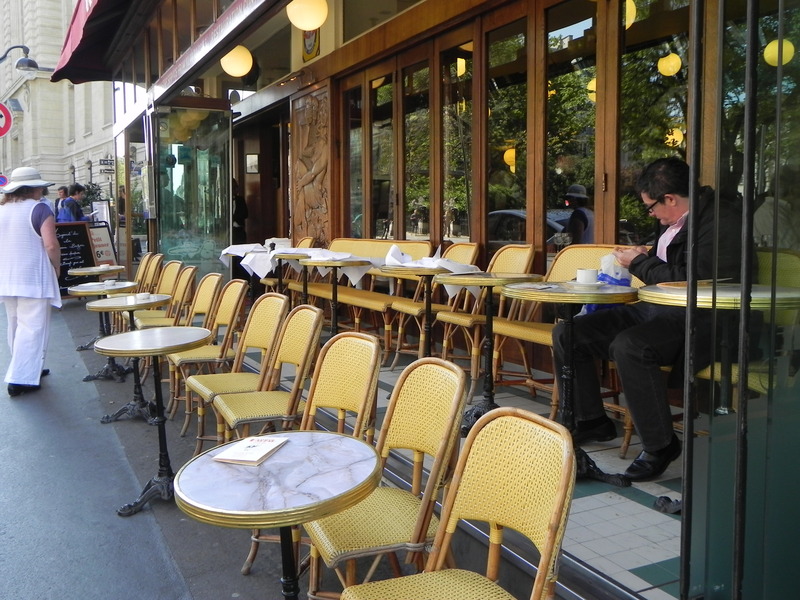 I remember Brasserie Balzar from my summer at the Sorbonne (1961! )–not so much for the food as for the notion that it (clearly!) hadn’t changed much since Camus and Sartre went there to argue. Camus had passed away the year before, but Sartre might even have been there while I was there (I wouldn’t have known him!). Bob perhaps you’ve articulated the Balzar magic. You must revisit your old haunt and give us a report. 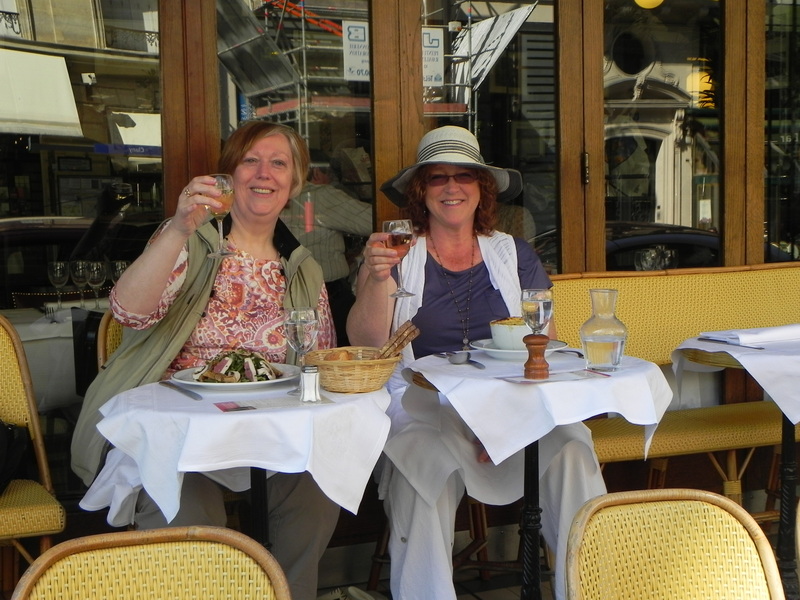 And I know the Readership would love a guest post about your carefree days at the Sorbonne…. ! I rarely have the same experience in restaurants that others have – and I’m sure that others would not share my own experiences. There is something about a particular place and time – with particular people with a particular waiter/ cook /meal/ ingredient/ wine/ dessert/ whatever that can make a place magical – for you. It’s just not always possible for that to be replicated nor is it always possible to convey the feelings one had on a particular outing and have another undergo the same. Still others can be a tad dishonest about their experiences in a famous eaterie, claiming a level of excellence that the visit really did not warrant, simply because it’s what is expected. As I become more of an E.T., I am trying to have no expectations of a place other than I should have a minimal enjoyment. When something is vastly superior, I am genuinely pleased. When I have a minimal enjoyment, my expectation has been net. It’s a win-win for me! All of that being said, i would love to sup with you and Nurse at Balzar and discuss everything from politics to oignons de printemps. Tim thank you for such a thoughtful comment! Perhaps I approached Balzar with unreal expectations based on what I read. Your advice is excellent and I shall adhere to it in future. A future, perhaps, that has us reviewing a Parisian menu together! Oh lala!